Have you ever had a job to do where you have no idea what you’re actually doing? For a developer, this may be the case when their customer doesn’t have a detailed specification. You can create a specification for all types of businesses, applications, and tasks. Not planning your project is entirely different to not planning your holiday! Setting off with a rucksack in the back of your car can lead to grand adventures and nights in your vehicle if there is no bed available at one of your impromptu stops. Technology is not like people. It can’t ‘make a plan’, or ‘wing it’ if something odd is thrown at it. It needs a predetermined path, an ‘if this, then that’ plotted route. The Route is the specification you need to plot very carefully, taking all considerations into account. Utilising a good specification can save time, confusion and effort when it comes to building a project. It is important that you have a good specification so that a developer knows what needs to be implemented. Creating a specification before starting to do any development is very important, as it will run through everything that needs to be done in your project. Within this specification, you should include a list of all the requirements you want the development to meet. By creating this specification and list of requirements, the developer will save time and have a much clearer image of the job at hand. Keep in mind they need the full, 360-degree view of your project. They are planning back-end connections, cubes and links; missing a step because your processing order was not communicated to them can mean reprogramming or planning entire sections. When you come to create your specification, it is important you do so thoroughly and account for all of the requirements you wish for the developer to meet. By doing this, it will reduce redesigning, recoding and re-testing later on in the development cycle. This clarity will also make it easier for the developer to come up with an estimated price, based on the requirements you have set. Take the time to collect accurate information, avoid repetition and make as clear instruction as possible; allow time to build the project with as little disruption as possible. If done correctly, you will leave fewer questions and clarifications for the developer to ask you about your project; which would then give the developer more time to focus on building your project. Ensure your specification draws on relevant and up-to-date standards, the drawing – or chart – should then help minimise the risks of dispute and legal action on a project. If you did ever find yourself in a position where there is a dispute on your project, having a clear specification puts you in a far safer position. First, outline the objectives: what do you want to achieve? This approach scopes out the necessary actions. At itas our consultant will spend 1 to 3 full days with you, asking you questions to fully understand your business processes. Make a detailed list: consider, in a detailed specification, all the requirements you want to be implemented. Have examples: how will your idea actually work? (Don’t worry! It doesn’t have to be technical), examples help if you have something specific in mind which may be difficult to convey to the developer. Include all information that your project will be connected to eg “I want my orders from my website to transfer into Sage 200”. Highlight the milestones: what tasks, or products, do you need to achieve your objectives? Include them in your specifications. Prepare the cost estimates: agree on the project timescale and identify the resource and skill to complete the work to the standard required. Costs will be estimates at this point but will give you a good idea of what to expect. Create a time schedule: transform everything into a graphic schedule. 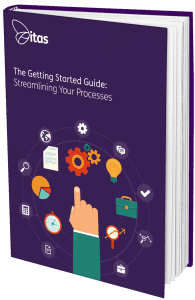 MS Projects, Prince, SmartSheet, Excel… the programme doesn’t matter so long as it’s clear and shows accountability. You can map the project against dates, times and frequency of tasks listed against planned resources. Risk analysis: consider all possibilities and evaluate the risks to time and cost. Don’t plan a ‘go live’ project for a date which means you are really cutting things too fine. Be wise. The scope write-up: this will help support the project, the developers, and the business, and ensures everybody understands and stays on the plan. Write up a scope that identifies the products, events, limitations, specification, dependencies, and risks. By implementing these 9 steps, you should create a clear picture in your developer’s mind. This will then cut down on development time, which will save you stress and money! Instead, change management is an integral part of the process. Speak to the people who actually use the systems! Ask them for help with specifications; they know what the issues are, the frustrations, what would make it easier to use, faster to process and give better customer service. Besides, engaging the users of the new system will have a huge knock-0n effect when it comes to dealing with resistance. A successful project is not just about delivering a final project to scope, budget and on time. It’s equally about making sure that the project also works for your customer and your staff. That it adds value to everybody. 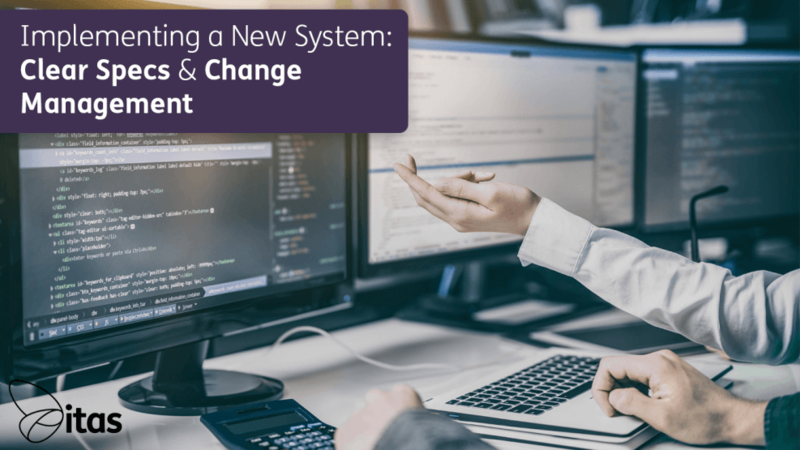 Ensure the system has what the users need the new change to deliver. And of course, the users have the training to feel confident in the new system. They are important when it comes to overcoming resistance to change. Human nature tends to resist change and it’s up to the project manager to understand the reasons behind the resistance. People are often more emotional than rational, a reasonable amount of patience and people-skills can easily overcome any resistance. Listen, engage and understand people. When we address people’s fears and concerns resistance generally disappears. So where clear specifications are vital for clear project development; developing relationships is key to successful project implementation. Warning: Do not feed the scope monster!